Kids don’t really think about it, thats why they are so accepting, but on the flip side, they don’t think about it much so they believe anything they are told from family, other children, the media ect … Parents need to talk about these things to their kids, or it will be left to playground insults of calling each other gay to shape there perception of sexuality. I think if I had been educated a bit earlier about this (or at all actually) I would have know more about myself. I never knew I had the feelings I did because I never thought it was something I could have. Of course I knew about LGBTQ people but I never thought that could be ME. Over the years everything became more confusing and it wasn’t until I went to university that I even started to really engaged in what it meant to be bi-sexual (a label I no longer identify with), I had the attraction but I never spoke about it much unless in flippant terms, or got involved in the LGBTQ community. My life has changed because of engaging with these people, not just because I’ve made a lot of friends, but because I started to learn about things. The more I knew there were names and explanations for how I felt, something many other people felt, the more I felt them. Maybe thats sounds odd but it was like I was being given permission to be me. I found out the label ‘Queer’ was a thing and looked into it’s meaning and took it as my own. I felt bi-sexual wasn’t really accurate and although queer can refer to a number of things I find it better to be vague then explain than use a term that isn’t quite right and have people assume the wrong thing. Back to about feeling like I was being given permission to be me. At some point I realised I really started missing wearing jeans. I think I was watching some of Arielle’s videos, and looking at her style and jokes about how lesbians dress and I was like ‘I wouldn’t mind trying that’. I had owned a shirt for a while and loved wearing it but never thought to buy any more. I got more. And more. And irritated when I didn’t have any to wear, like I used to feel when I had to wear school uniform. At the same time my undercut expanded and my hair got ‘accidentally’ cut short. I thought about how when I talked about ‘women’ in contexts like feminism I never really felt like I was talking about me, but some other group. I never worried I was manly, I never have been and never will be. I have traits some might consider male, but I don’t really by that way of thinking. I knew a few people who didn’t identify with gender, and the more I thought about who they were, the more I saw that was who I was. So no I have to leave past tense behind. I’ve felt this way for a few months but didn’t want to say. I know there are harder things to share with the world. But I’m still scared. I’m worried that people won’t get it, will ask me to explain constantly. 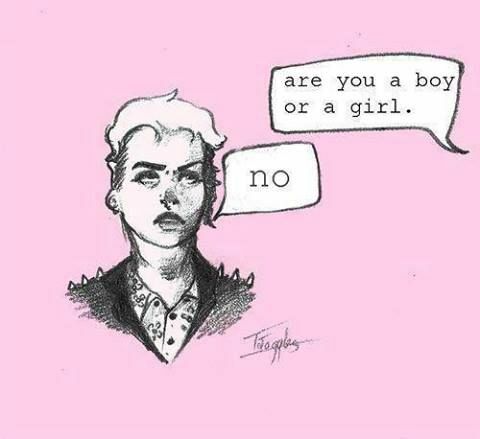 What do I say to strangers who mis-gender me? What if I realise in a years time of whatever this is not the case and have to go ‘sorry guys I’m not actually genderqueer’. What if men or queer women don’t like me in a romantic way because they don’t see me as a woman? But thats what I’m trying to say now in this really round about way. That I don’t identify as a man or a woman. I’m just this floating thing. Like a balloon. A genderqueer balloon. This started as a Facebook status and after about 200 words I knew now was the time just to bloody get it out there. I like girly stuff, I do love a good skirt and heals. And I like shirts, and guys hats. And it’s not all about aesthetic. I wonder why I didn’t know sooner, but then I look about my red, vaguely gendered bedroom thats been this way since I was 13 and think maybe it was pretty obvious I just had no words. And that brings me back to the point I made at the beginning. Educate young people so they have the words, so if they have these feelings they know what they are and don’t have to wait as long as I did to figure out who they are. Some days I’ll look girly, some days I won’t. Some days i’ll pull a face at heavily gendered things and others I’ll love them. I don’t know, I just take each day at a time. So would you mind they/them for me as a pro-noun? I can’t keep just doing it my head anymore, its a real thing of me now, it seems so silly to keep it inside. And I totally reserve the right to realise I was incorrect, although I can’t see that really happening. 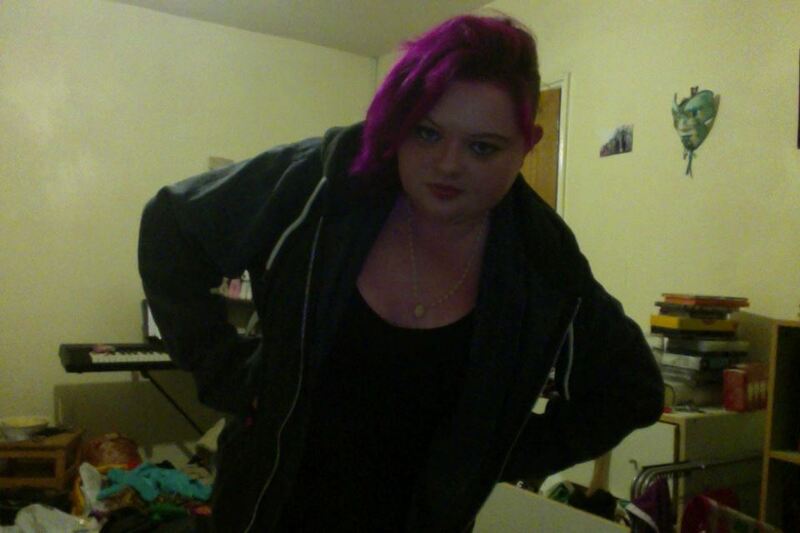 First picture I took of me in my newly expanded non-binary gender wardrobe. Previous youtube conversation continued, what an actually feminist says about feminism. I tried to be as patient, rational and civil as I could. me – ok this is really the last time I am going to say this. Feminism can, depending on who you are talking to and what kind of activism they focus on, primarily focus on issues to do with the oppression of women, as feminism can focus on women, not much does and this is something important that does. However, an example of feminism fighting something that actually shows women in a negative light can be given in this example. I was watching a video of what would you do (you can find it on youtube) a man getting angry and physical with his girlfriend in a park, many people stopped to protect her. The reverse people did not stop or cheered assuming the guy deserved it. This is due to the perception of gender projected by society. If women were not seen as weak, and violence and abuse from them would be seen as just as much as a threat as it would be from men, and this sort of thing would not happen. Feminisim wants to break down gender roles and stop women being seen as weak. If this happened women abusing men would be taken more seriously, as it should. I really can’t stress anymore what this movement is about and I don’t want to spend anymore time on it as it is research you could easily do yourself. me – you really can’t have it both ways. while women don’t have the same physical strength of course they have the same capacity to harm and abuse men, which should be stopped and would be helped by female violence not being diminished, which is down to gender roles. I’m unfollowing this discussion now, because as fun as debate and trying to inform people is , and trying to see another point of view, your not trying to understand what i’m saying, not trying to research any of it or debate it with actual fact as opposed to opinions. I hope that you are a young man, because as you grow you will learn more about women and have more women impact your life, and maybe listen to older men who support the women in there lives. If you are an older man who isn’t intellectual enough to consider the thoughts and realities of a very large movement and accept there are injustices to women with out ALWAYS having to hit back saying ‘but men have …’ then i’m afraid its probably to late to change your views, which as the world changes will end up with you being that person who says something inappropriate at a party and no one knowing what to say or wanting to invite you back.